JC, assuming you're using Firefox as your browser of choice and that your n800 supports AddOns, check out Foxmarks. I can't imagine not having my bookmarks auto-synced between all my machines... That would make me crazy. 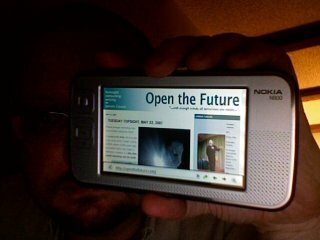 The n800 comes with a version of Opera. As far as I can find, FF isn't out yet for this system. Apparently it's not as straightforward as a simple recompile. Those things look pretty cool.